Robfg.com does not share any personal information about its readers. Email addresses, or other personal information is kept strictly confidential. All quantities or positions of anything are only judgmental comparisons to other entities. For instance, we say a snail is slow – well ok, but that determination is only a comparison relative to something we visualize as faster. There is nothing that can be quantified without a comparison to other entities. Some of the expressions we use have become standardized. For instance, the use of the term ‘rich’ conveys the message that a person has more than the average of wealth. Or, in the case of foods, an abundance of calories or fats as compared to other similar foods. So the term ‘rich’ automatically conveys the idea of plenty, or even excessive amounts when compared to the accepted normal for a particular subject matter. But be mindful that all descriptive terms, whether standardized or those that need additional comparisons just for perspective, have a basic relationship to other values. How can the term ‘high’ make sense if there is no perspective to something that is lower? 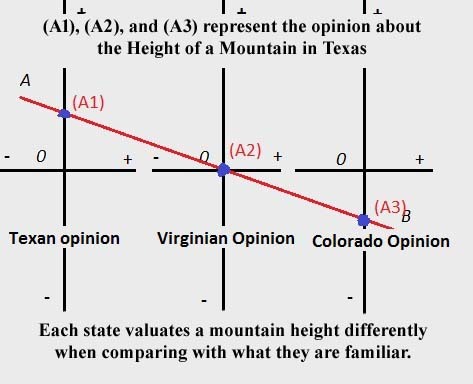 A high mountain is Texas may only be a foothill in Colorado. All descriptive terms need definition or there is no meaning. To add further confusion, there may be an infinite number of comparative choices that can be made to communicate an idea. Superlatives may be chosen to give greater emphasis to a value using such as the expressions, “Faster than greased lightning”; or, “Slower than molasses on a cold morning”. Without using relationships to known attributes, most of what we say would be meaningless. If math is thrown into the equation, things can get really interesting. Suppose you were tasked to dig half of a hole. Without quantification it would be impossible. But if the task was to dig a six foot deep hole, and when you got to the three foot level, then your hole would half of the six foot deep hole. The number zero is also a relative term. Zero can represent a base quantity that has no relation with an actual numeric count. You cannot have an object that is zero but you can refer to the numeric count of the object as being zero. You can travel in a negative direction (relative of course) but you can only travel at a positive speed – even though you are perceived to be going backwards. It is the relationship to another entity that makes going negative seem to be the reality. Two balls are thrown at the same time. One ball is slightly faster than the other. If the faster ball becomes our point of origin, then the slow ball is moving in a negative direction from the faster ball. Instead of the two balls, take a look skyward. We see two stars. We determine that they are travelling in the same direction because of their relationship to other stellar bodies. If we perceive, because our point of observation is also in motion, that the lead star appears to be stationary, then the logical conclusion would be that the slower star is traveling in the opposite direction. If there is no difference in speed or direction between two objects, and we disregard their relative position to other objects, they are stationary relative to each other. It is therefore illogical to think there can be a fraction of anything without a reference to a whole. Motion is impossible without a differing distance to another object with which to gauge that motion. Only the number of objects can be zero, not the object. In fact, our universe can only be described in terms of relationships or we have no motion, temperature, size, distance, light, dark, or mass. On the human side of relativity, again, we find all facets of being a human are quantified. Emotion, love, normal, average, beauty, speed, health, strength, color, and height are just a few of the many descriptions of how humans perceive themselves and other humans. Compassion is also a relative term. Compassion is the empathetic or sympathetic outflow of emotion we feel towards another. Compassion and guilt can also be used synonymously because they are so closely related. Empathetic emotion differs from sympathetic emotion only by definition. If you are empathetic to someone or a cause, you relate yourself to that person or cause because you can see yourself similarly disposed because of your life’s experiences. Sympathy however, is a feeling of pity for what has befallen a group or individual. Guilt can also cause the same emotions for the underprivileged if a person believes that somehow his/her status in life somehow contributed to the plight of others. Politicians are especially gifted individuals at manipulating these emotions to their benefit. Being able to stir the emotions of a group is a powerful thing. Charities could not exist without their ability to make you sympathize with and thus donate to their cause. Bringing up charities represents my way of saying that our proclivity to having these emotions is not all bad, but bear in mind … evil dictators have flourished because of their expertise at emotionally manipulating others. So as humans, we all have to pay homage to our emotions. The emotions we feel are always relative to known values. Feeling good, an emotion expressing our current status would be meaningless without the understood difference of a different state of being. All states of being are relative to another state. For instance, feeling bad is better than feeling really bad but worse than feeling good. "Good judgement comes from experience. Experience comes from bad judgement." - Unknown, quoted by Jim Horning, Will Rogers and others"
Retired from the offshore drilling industry where he worked as an Electrical Supervisor, Licensed Chief Engineer, and Electrical Designer. Robert Writes for 2 Online Magazines and three private web sites. Interests include computers, Cosmology, Evolution, and Environmental Research. Robert welcomes your input whether you agree or not, and will respond via published commentary to all responsible comments.